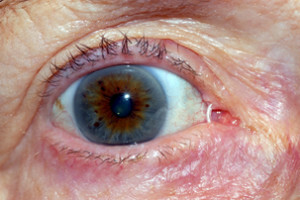 The lacrimal gland, situated in the outer portion of the upper eyelid (see diagram below), produces the tears which drain downward and inward across the eye. Blinking of the lids helps to spread the tears to lubricate and protect the eyes. The tears drain into the superior and inferior puncta, located at the inner part of the upper and lower eyelids, and are carried by the superior and inferior canaliculi to the common canaliculus, then into the lacrimal sac. 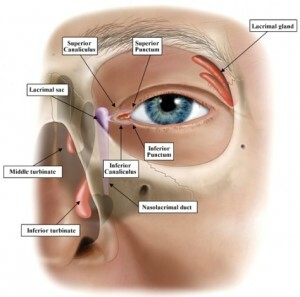 The lacrimal sac is a small pouch located next to the nose. The tears then drain into the nose (see diagram below). A blockage at the lower end of the nasolacrimal duct is the most common cause of a tear drainage outflow problem leading to a watery eye. Surgery can be performed to create a functioning tear drainage system where there is an obstruction to the tear duct causing a watery eye. An endoscopic dacryocystorhinostomy (abbreviated as end DCR), an operation performed for an obstruction in the nasolacrimal duct, is undertaken through the nose with the use of an endoscope. The use of an endoscope is preferable for younger patients, female patients in particular, as it avoids the need for a skin incision and so does not leave a visible scar. Only a very small proportion of patients are unsuitable for this approach e.g. they have a small nose with limited access for the instruments. This can be determined in clinic before a decision about the surgical approach is made. The success rate of this procedure in our hands is better than 95%, the same as the traditional external approach. Click here to listen to a patient describing her experience of an endonasal DCR. In the event of a failure the surgery can be repeated. During the surgery, the lining of the lacrimal sac is attached to the inner lining of the nose (the nasal mucosa) to create a new passageway for the tears. A fine silicone tube (a stent) is usually placed at surgery to maintain an opening in the tear drainage system. This is removed after about 6 weeks in the clinic. This takes seconds to do.This operation is usually performed under general anaesthesia either on a day case basis or with an overnight stay in hospital. The endoscopic approach cannot be used for patients who have a blockage in the common canaliculus or the canaliculi. This requires an external incision or the placement of a Lester Jones tube. If the surgery has failed in spite of a re-operation the symptoms may instead be overcome with the use of a Lester Jones tube. What are the possible complications of an endoscopic DCR? Scarring of the new tear drainage pathway. This can lead to failure of the procedure and the need for further surgery. A stent prolapse. It is important to avoid rubbing the eye, blowing the nose or holding the nose when sneezing to prevent this. If the stent prolapses it will need to be replaced with an endoscope in clinic or it may need to be removed earlier than planned. You will be given instructions on how to perform nasal douching using Sinurinse (see below) which you should commence 1-2 days after your surgery. You will be given a nasal spray to be used 4 times a day for 14 days postoperatively (Beconase). If the silicone stent comes out as a loop in the inner corner of the eye, simply tape it to the side of the nose and report this to the hospital during normal working hours – this is not an emergency problem. DO NOT CUT IT OR PULL IT. To learn more about Endoscopic DCR, please contact us at today to schedule an appointment.